If you’ve been following along you know by now that I attended a few events in the city this past week, including the Getting Gorgeous event, which I wrote about here. I will be sharing more pics of the other events I attended, but for now I wanted to show what I wore to them. I wanted something that would look polished but still comfortable enough to wear while I commuted through the city. It was hot, humid, & rainy, and I literally was trying to keep myself from melting away. I decided on the zipper linen jacket I wore on my Birthday here, a lace tunic top, black pants, and new Kate Spade bag! I’m absolutely in love with it. The outfit wasn’t as easy breezy as I had hoped, but I still managed to make it through the day. Hope you have a great week lovelies! Love the look Jenny, chic and comfy while commuting in the city! Love the bag. I ADORE this outfit, so chic and stylish and love that purse! 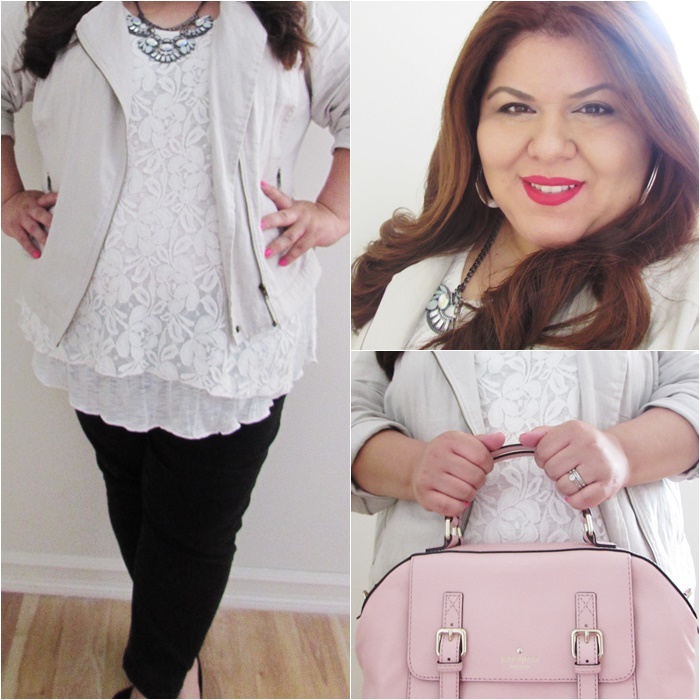 Chic Lace & Pink Bag GorgeousNess! Very nice with the pink bag. I totally love summer whites! Love it! The silhouette is very, very flattering and perfect for yucky Summer days!